Following the colossal battle against the Empire's warriors, Eragon and Saphira narrowly escaped with their lives. 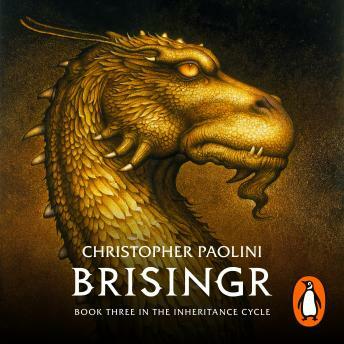 But more awaits the Rider and his dragon, as Eragon finds himself bound by promises he may not be able to keep, including his oath to cousin Roran to help rescue his beloved Katrina. When unrest claims the rebels and danger strikes, Eragon must make choices that take him across the Empire and beyond, choices that may lead to unimagined sacrifice. Conflict, action, adventure and one devastating death await readers as Eragon battles on behalf of the Varden while Galbatorix ruthlessly attempts to crush and twist him to his own purposes. Can he become a leader who can unite the rebel forces and defeat the King? Great book! While some parts of it drag on, those parts are necessary for readers to fully understand Eragon's world. This book is full of action and plot twists the reader doesn't expect. The narrator is amazing as well! The voices fit the characters well. First book I’ve ever listened to.. I fell in love. The narrator does a pretty good job with the voices of the characters but Saphira’s voice is super goofy. It took me about half the book to stop laughing out loud every time she spoke. Other then that it was quite an entertaining listen. I loved the twist in this book! So I had already read the whole series before this and absolutely loved them. Some of my favorite books to read when I dont have anythig else to read. However when I first listened to the audio book and the narration, I realized that this was much better than reading the book! I love it! a little long winded. needs more action, less talk. fantastic narrator. Love this series, not what I expected for the voices it in getting used to it! A great book. Well done, very well done. I also loved Roran and Eragon adventure.